You do not need fresh raspberries to make this delightfully refreshing Raspberry Sherbet. Frozen unsweetened raspberries will do just fine. Which means that you can make this intensely flavored frozen dessert all year round. I love how easy it is to make. Besides raspberries, all you need for this beautiful rose colored Sherbet is sugar, milk, cream, and a splash of lemon juice. Sometimes I like to stir some dark chocolate chips into the freshly turned Sherbet. You can serve it with fresh raspberries, vanilla ice cream, chocolate ice cream, or even with a small dollop of softly whipped cream. The possibilities are endless. A Sherbet is a cross between an ice cream and a sorbet. The raspberries give it a really nice tart yet sweet flavor and by adding cream and milk you end up with a creamy, yet slightly grainy frozen dessert. While you can use fresh raspberries I normally use frozen unsweetened raspberries because the flavor is consistent and they're available year round. However, you could an equal amount (12 ounces (340 grams)) of fresh raspberries. While not absolutely necessary, I like to strain the raspberries before stirring all the ingredients together, so as to remove those tiny raspberry seeds that always seem to get caught between your teeth. 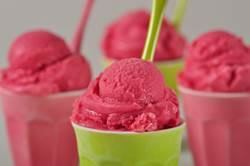 There are two ways to freeze the Raspberry Sherbet, either in an ice cream machine or you can "still freeze". This means you just pour the mixture into a metal pan and place in the freezer until frozen. Just remember to give the sherbet a good stir every 45 minutes or so to add air into the sherbet plus to break up any large ice crystals. Raspberry Sherbet: Strain the thawed raspberries to remove the raspberry seeds, by gently pressing them through a fine meshed strainer placed over a large bowl. (You will have about 1 cup (240 ml) of raspberry juice. Throw away the raspberry seeds.) To the raspberry juice add the remaining ingredients and stir to combine. There are two ways you can make this Sherbet. Method One: If you do not have an ice cream machine you can 'still freeze' the sherbet. Which means pour the mixture into a metal pan (so it freezes faster), cover with plastic wrap, and place in the freezer for about four to six hours or until firm (it will have a consistency somewhere between an ice cream and a sorbet). Stir the mixture every 45-60 minutes to break up any large ice crystals that may have formed. Method Two: If using an ice cream machine, first cover and chill the mixture in the refrigerator for several hours until cold. Then place in your ice cream machine and process according to the manufacturer's instructions. If still soft, transfer the raspberry sherbet to a covered container and place in the freezer for a few hours, or until it reaches the desired consistency.